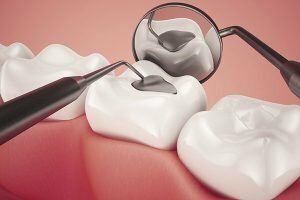 Tooth fillings, dental crowns, and inlays and onlays are dental restorations that restore your teeth’s function and beauty. They stop dental problems from worsening, protecting you from further damage. They are made of durable materials and can effectively participate in your teeth’s day-to-day functions. However, despite their durability, these dental restorations can be damaged. We at Ria Family Dental consider such damage a dental emergency because of its consequences, inconvenience among others. For lost or damaged fillings, crowns, or inlay/onlay, Ria Family Dental is the one to trust. We have same-day emergency appointments for your dental emergency. All dental restorations have a breaking point. Over the years, their everyday participation in your teeth’s day-to-day activities can cause them to weaken and break down. Your dental restorations may be durable, but that does not mean that you can abuse them. Using your teeth as tools outside their natural functions, for instance, can cause damage. Tooth decay is the most common reason for getting a dental restoration. During treatment, all decayed parts are removed. Poor oral hygiene can cause secondary cavities to develop weakening your tooth until it cannot hold existing restorations. Poor dental work greatly affects the durability of your dental restorations. Remove all broken parts left in your mouth. This is very important to avoid breathing them in and causing an infection. Take OTC pain relievers or apply clove oil on the affected tooth to reduce pain and sensitivity. To ensure that there is no danger, an X-ray may be performed. This is to check if there are pieces of a broken dental restoration in your lungs. Sometimes damage is minor and the dental restoration can be reattached. In other cases, the dental restoration will have to be replaced entirely. If you or your loved ones have a dental emergency, you can count on your trusted Ria Family Dental dentist. We have a same day dental emergency appointment to relieve you of your pain as soon as possible.